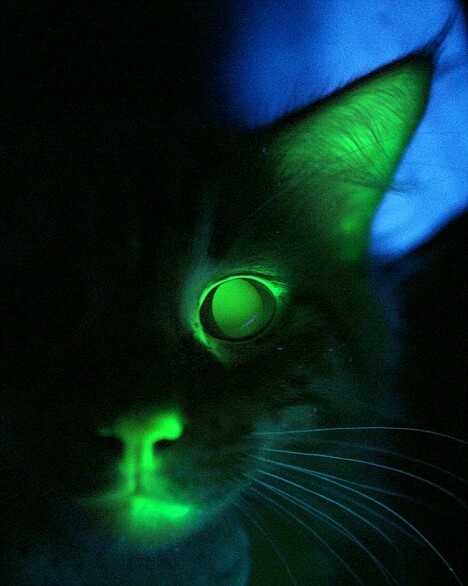 Evolution will now dictate that mice evolve a black light emitter. While I understand the goals of this gene splicing as a cat lover I'm most roundly offended that some would create a monster cat ! Monster? I'm not seeing that and I am a cat lover. An "engineered" plant or animal IS a "monster" in every sense of the term. In the sense that this cat is an "unnatural production; an abnormal creature; a freak"...yes, it meets the definition of a monster. It is also a "marvel"! Make for one heck of a Halloween! !